Dana is good to go and close to creating reports of the situation along his coastline. As winter is approaching a fast boat will be best!! Intrepid II Is One Such Beast! rogues and villains attempt to slander Dana and have him arrested. 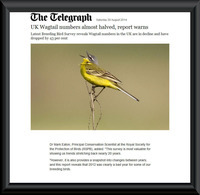 Telegraph:UK Wagtail numbers drop by 43%, Researchers suggest that changes in agricultural practices have driven this decline, but it says the species is a long-distance migrant so conditions overseas cannot be ruled out. ENENews: Death washes up on the coast. If one listens to Leuren's presentation in the previous Vid', one gets an idea of exactly what this might be. 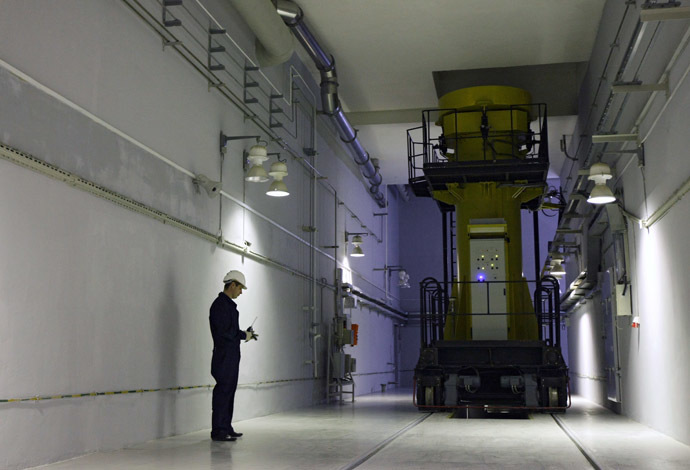 The first ten kilograms of the mixed-oxide fuel (MOX) - a mixture of plutonium and uranium dioxides (UO2 and PuO2), have been industrially produced by Russia’s nuclear monopoly, Rosatom, at the Mining & Chemical Combine (GKhK) in the Krasnoyarsk region. 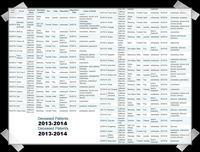 As threatened by Dr Brad Anholt director of Bamfield Marine Science, Cornell have deployed their big guns. First up is Drew Harvell who comes out spitting fire about climate change effects on the now extinct sea stars. Not a single glance is gestured eastwards and certainly the 'R' word is not proffered...as expected. manny sky watch's latest contribution proffers a new look (to me) that the trenches are in fact filing up with heavier material and that by 2021 will have cooked the lot. The plumes are a red herring (in a way) that the scientists are obsessing about, a classic misdirection, kenny b's bucket and spade brigade being a prime example. If the Russian test results that are ongoing come up with an AOK, then we must understand that they too have become corrupted. 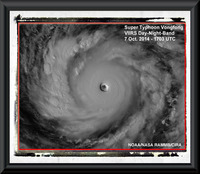 The gathering storm 'VongFong'? looks like the end for anything in it's way. Totally and completely. In this image the most foreboding storm has gathered with such a clout that i feel it can only have become much much stronger through the picking up of debris along the way to add to it's immense velocity. This storm runs the very real risk of being the first of it's kind so fully loaded with billions of pieces of Washed away tsunami coastal debris. Just looking at the outer edges fills me with horror and i simply can't take it in. The eye remains a window onto the soul of this storm..
A more incomplete article and evidence of lazy and slanderous reporting would be difficult to find. Connectingdots2's attempts to involve the police,fraud office and now local news papers may well see him behind bars before too long! Wow, starlight. What a twisted article of lies that is. That dot guy is an egotistical troublemaking liar. Good Lord! How can he stand himself? How can anyone believe what comes out of that guy's mouth? Not to mention, he has a very creepy sounding voice. 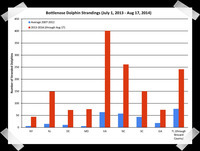 A distressing mass stranding of a seemingly fit school of dolphins in what appears to be clear waters. Perhaps the work on her teeth was becoming cost prohibitive as a result of all the lies passing through them? An action packed conversation worthy of attention. Iodine-131 found in Los Angeles coastal waters... "We don't know where it's coming from..."
Are we to be at war? Who will issue the ultimatum? when will the pocket watch melody stop and the cold silence begin? mok-up....someone forgot the flowers and this is no small matter! the tests went well by all accounts but practice makes perfect.. even for this final curtain. Only now can the real thing begin....waiting. The Generals curiosity peaked at the red light flashing in front of him causing him to momentarily panic and fluster. and for what seemed to him an endless moment of eternity glimpsed, for a few seconds he closed them. each smile, forgotten moments and loving embraces replayed to perfection, and that trapped behind the veil of death we might reach out and cry one last time, One last tear as all is swept aside as if it were ever here. what have we now to show for this world? are we to come back? surely the best this time! with a group of 25 seen swimming eastwards near the coastline.